2. When are link-state packets sent to neighbors? 3. Why is it difficult for routing loops to occur in networks that use link-state routing? 4. Refer to the exhibit. When Router D is configured to use a link-state routing protocol and is added to the network, what is the first thing that it does to begin learning the network topology? 6. What speeds up convergence in a network using link-state routing? 8. A new network administrator is given the task of selecting an appropriate dynamic routing protocol for a software development company. The company has over 100 routers, uses CIDR and VLSM, requires fast convergence, and uses both Cisco and non-Cisco equipment. Which routing protocol is appropriate for this company? 9. Which database or table must be identical on all link-state routers within an area in order to construct an accurate SPF tree? 10. Refer to the exhibit. What does JAX do with link-state packets from ORL? 11. What feature do modern link-state protocols provide to minimize processing and memory requirements? 13. Refer to the exhibit. Which statement correctly describes the path traffic would take from the 10.0.0.0/24 network to the 192.168.1.0/24 network if a link-state routing protocol was in use? 14. Refer to the exhibit. 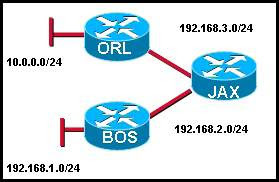 What kind of information would be seen in an LSP sent from router JAX to router ATL? 15.What action does a link-state router take immediately upon receipt of an LSP from a neighboring router? 16. What is the final step in the link state routing process? 17. Which algorithm is run by link-state routing protocols to calculate the shortest path to destination networks? 18. Refer to the exhibit. If all routers and interfaces are configured to use a link-state routing protocol, from which routers will router D receive hello packets? ciscotoetsantwoorden.blogspot.com. Mogelijk gemaakt door Blogger.